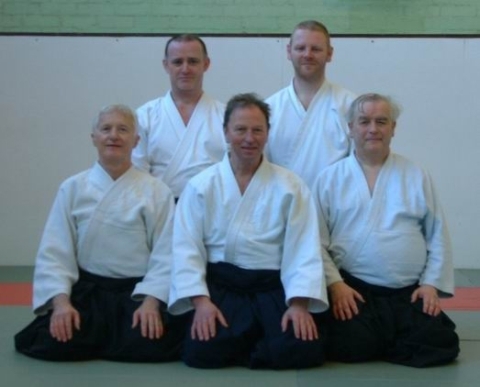 As a member of the British Aikido Federation (BAF) we follow a traditional approach to Aikido training. Members are encouraged to attend regular courses with Kanetsuka Sensei (Shihan – 8th dan) which are held throughout the year. The Oxford University Aikido Club was founded in 1971 and The Oxford City Aikido Club in 1975. Together they form The Oxford Aikikai (kai means ‘a society’) and share the same premises at the Oxford University Sports Centre, enjoying superb facilites with a purpose-built dojo (practice room) and permanently laid tatami (practice mats). One particular advantage of this arrangement is that practice can continue throughout the University vacations. Our Chief Instructor Richard Martin (4 Dan) was promoted to Fukushidoin in 2016. He is assisted by fully qualified resident instructors Bill Jackson (5 Dan), Nick Belshaw (3 Dan), Graham Jones (3 Dan). Until his passing in April 2016 our Chief Instructor was Peter Megann (6 Dan) who had been active in martial arts for over 40 years. During his university days he was Captain of the Oxford University Judo Club. After graduating he instructed at the University Judo Club for many years before devoting himself to Aikido from 1971 onwards; and has been a dedicated student of Kanetsuka Sensei for 25 years. Peter Megann was the General Secretary of the British Aikido Federation and Chairman of the British Universities’ Aikido Federation. A variety of Aikido 'styles' have developed over the years, but the Aikido of The Aikikai Foundation remains the orthodox Aikido as conceived by the Founder of Aikido, Morihei Ueshiba (Osensei). It is a weaponless system designed solely for self-defence and as a discipline for self-improvement, it is essentially non-violent and non-competitive. This is the Aikido taught and practiced at The Oxford Aikikai.